We are meeting yet again for our annual Gala Dinner bash towards the end of Oct 2015. Last year, we met to rekindle the “good old days of Depot road”, over good food and wine and almost one-third of attendees walked away with a prize but all walked away with a whiff of nostalgic baking aroma…yes it’s Don’s pie! 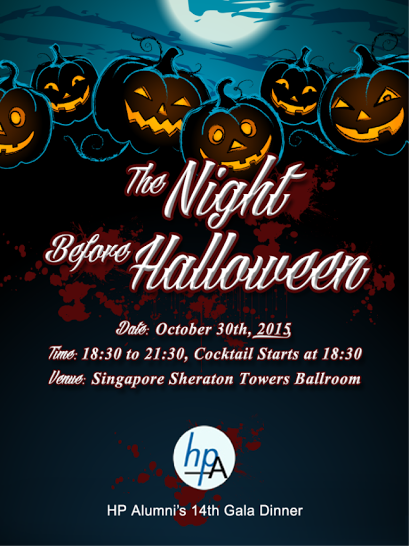 This year we are bringing to you a “Themed” evening — “The Night before Halloween” where you can come, dressed in Halloween outfits. Absolutely No religious connotation but just a fun filled night where you get to see a world class magician performing on stage, get your face painted for those not coming with makeup, be “tricked or treated” by — who knows it could be Chee Kong, Mary or even Jok Kwang under their hoods, be serenaded by the strumming of Ukeleles and all these over good food and wine in a nice setting at the Ballroom of Sheraton Towers.